Completed Bringing in the New Year! Discussion in 'Completed World Events' started by Zelda, Dec 24, 2016. Not an ore was dropping, not silver, not gold. Players wondered where THAT DAMN UPDATE WAS AT, FAM. 2016 has been a rough year for everyone, so we're excited to bring in the new year with you all! Head over to the Free Market to fill yourself with that warm and fuzzy feeling for the holidays. Don't forget to turn on your music! NPCs are maintaining the Free Market with magic harvested from Snow Vigors. Snow Vigors drop from all mobs across Destiny, and can be won by competing in our Snow Rush event! An automated Snow Rush event will be held every 3 hours. Compete on two teams by using your regular attack to roll your snowball across the finish line first! The team that pushes their snowball all the way to the end will earn a few extra Snow Vigors! They are also available from completing Party Quests, Jump Quests, Bossing, and daily quests given out by MrSno in the Free Market! Collect Snow Vigor and hand them in with MrSno for a chance at something special, or trade in a lot of them for a brand new Crystal Rudolph! Our Traveling Hair Stylist Murphy the Zombie will be making an appearance sometime before 2017. Bring in the New Year with a new look! White Scrolls now have a boosted drop rate from Gachapons! During this event, head over to your Gachapon of choice and try your luck! From "unofficial technical support" to GM, our staff member Indie has been promoted to Developer status! Indie will now be working alongside Cipher and Exodus, helping to further the development of our world. We are so excited to be working together on pasta! I mean, projects! To see what Indie has been up to since moving to development, head on over to our Update section! 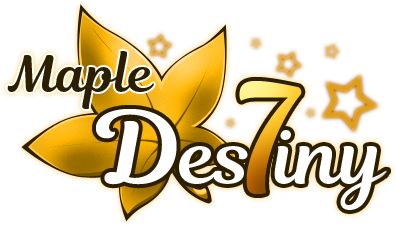 Although most of our announcements are positive ones, we are saddened to announce the official departure of our long time GM Shuryo, who will no longer be a part of the Maple Destiny staff team. Shuryo was one of the most dedicated and fun-loving people we've ever had the chance to work with. When others left, he did his best to help keep this family together. We will always appreciate everything he has done for the server, and he will be missed. Thank you Shuryo. We wish you nothing but the best! Another change we're seeing is Clean Slate Scrolls. Upon logging back in, any Clean Slate Scrolls you've owned will be removed. They are also being removed from global drops, gachapons, and PQs. The reason is because they are receiving a pretty big change that we hope will offset the incredible demand for White Scrolls. Clean Slates will now no longer boom your item upon failure. More information on how to obtain Clean Slate Scrolls will be released at a later date, but expect to be PQing and bossing (among others) to gain your CSS. There have been a lot of ups and downs this year, but we are so thankful for each and every one of you. Thank you all so much for sticking with us, and supporting us, even though we are far from perfect. They say this season is best for spending time with your family and loved ones, and we couldn't agree more. We are all so happy to be able to spend our holidays with you, and hope to spend many more together. FatCat, BlazeWizard, Cuppy and 10 others like this. FatCat and acoluccc like this.